No internal or external shield required because the case itself is SFI 4.1 Certified. No flexplate shield required because the bellhousing is SFI 30.1 Certified. Uses all stock and aftermarket internals; no oddball parts. Bellhousing is part of the case just like the Powerglide so all machining alignment remains perfect. Made by a permanent mold process from heat treated aircraft grade aluminum. This process is stronger, more ductile, and more accurate than competitors' brittle sand castings. Oil pan flanges are thickened to stiffen case. Beefed up oil pump area prevents front case distortion under high horsepower. Minimizes flexing which causes gear misalignment and breakage. This case does not leak! Oil pump mounting bolt holes Heli-Coiled to prevent thread failures. Patented adjustable transbrake release. Adjustment bolt varies both the quickness and the rate of release which varies the reaction time and the hit of the tires. Predrilled for double dump transbrake. Redesigned oil passages radically improves release time of the transbrake and allows instant application. Patented reverse piston bleed hole vents air from piston area and increases transbrake consistency. No need for internal or external shields or bottom straps. Each case is thoroughly inspected at every step of its production. You can be assured that you will not have the problems associated with porosity and misalignment from poor castings or inferior machining as with other cases. 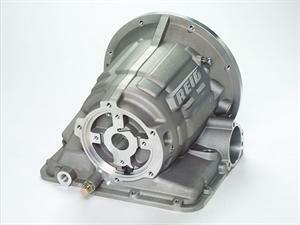 Reid Racing's 2-piece Superglide transmission case allows use behind all popular engine combinations. Starting with the time proven 1-piece Superglide, Reid Racing engineers decided against the "cut it in half" approach and specifically designed this case to be used as a 2-piece unit. The full 360 degree reinforced mounting flange provides the needed rigidity and stiffness, while extra thickness in critical areas adds strength to the rear of the case and eliminates the need for an internal liner. Unlike our sand-cast competitors, our permanent mold casting process is used for extremely accurate, tough, porosity-free cases. Adapter bellhousings and flexplates are available for most popular engine combinations. 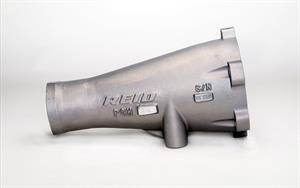 Bellhousings available for Chevrolet, Buick, Olds, Pontiac, Ford, and Mopar engines. Indexing ring on the oversized flange properly centers bellhousing. 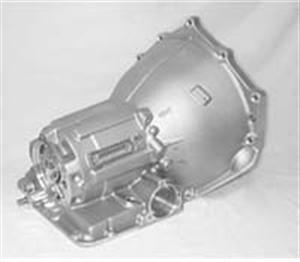 Front pump can be installed with or without the bellhousing attached. Oil pump mounting bolt holes heli coiled to prevent thread failures. No need for external shields or bottom straps. This new case gives dramatic strength increase over the standard sized powerglide output shaft and has a high performance bronze bushing. For use with any of Reid's 7 bellhousings. 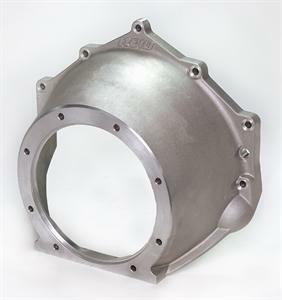 Cast from high-strength aluminum and heat treated for additional toughness, the bellhousing passes the stringent SFI 30.1 certification and is approved with no external shields required. The bell features an open bottom for easy converter access, a reduced diameter for better floorboard clearance, and a contoured mounting flange to properly match the rear of the engine block. Special Note: No speedometer cable provision is supplied.